Healthcare never stops, even around the holidays. Fall off a ladder and break your leg hanging Christmas lights? An acute care physician is available to help. Burn yourself lighting the menorah? Nurses are on the clock ready to treat you. Uncle Jim get a little too close to the New Year’s Eve fireworks? Emergency medical services are on call. The holidays are a special time of year to come together for family meals, friendly celebrations, to exchange gifts and to appreciate all the things in our lives. The holidays can also be fraught with accidents and injuries as general travel and vehicle traffic spike along with cooking catastrophes, decoration disasters and frigid falls. 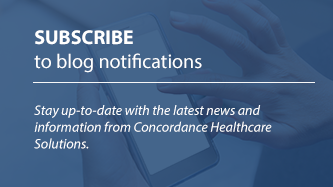 Protect yourself and keep your family safe this winter with some seasonal insights from Concordance. In addition to accidents and injuries, everyone also gets sick from time to time, especially over winter holidays. Unfortunately, we can’t plan our next cold, but we can take preventative measures. Be sure to practice stronger hand hygiene around the holidays by washing your hands properly with soap and water or hand sanitizer. The holiday season also runs parallel to flu season. If you find yourself sick with the sniffles, abstain from holiday office parties and family dinners. Landed in the hospital around the holidays, now what? For residents of long term care facilities or those staying in the hospital awaiting or recovering from a procedure, the holidays can be lonely. Feeling left out of the festivities and being away from familiar faces and the comforts of home can dampen spirits. Similarly, it can be heartbreaking for family members at home observing holidays while someone important to them is spending the holidays in the hospital due to health concerns. If you find yourself or a loved one stuck in a hospital this holiday, consider spreading some holiday cheer to those around you such as your physician, nurses or other hospital staff. Many are away from their friends, families and loved ones. Give a simple gift or thoughtful note to show appreciation and brighten their day or evening! 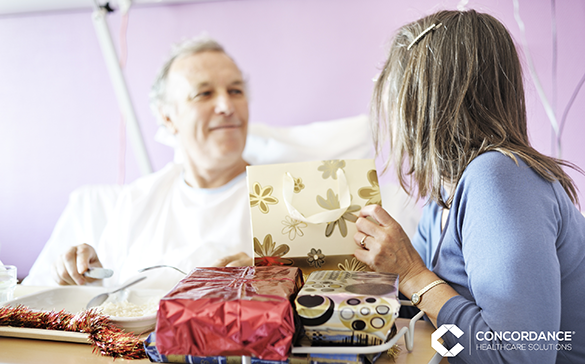 Spending the holidays in the hospital isn't ideal, but you have the power to bring a smile to someone’s face. In turn, doing things for others can also make your time spent in the hospital more involved or rewarding. In the age of social media, cell phones and other digital distractions, face-to-face time with another human being can be a humbling and rewarding endeavor. Celebrating, making memories and spending time together is what makes the holiday season so special. Concordance Healthcare Solutions supports those who continue to provide quality care, even on the holidays, because we know healthcare never stops and we never stop helping. Contact Us to learn more about how we can help you this holiday season and all year round.